Churches vary widely in just how they practice the ritual meal of bread and wine, instituted (so we say) with Jesus’ repurposing of elements of the Passover meal on the night before he was crucified. But while they disagree (sometimes to the point of mutual exclusion) over the ritual details, over whether the practice includes an element of the miraculous or merely material symbols of transcendent truths, and even over who is authorized to lead or conduct the ritual itself…despite all these disagreements, every church I know, in its own way, has made of “the Lord’s Supper” a highly ceremonial practice, conducted in the context of a worship event, usually in a place set aside for such events. This is not enough upon which to hang a doctrine or destroy somebody else’s fondly-held belief. But I wonder if Paul had an insight we have lost in our ritual. Rather than creating a sacred, symbolic (or miraculous) meal to be received in the context of a sacrament, I wonder if in fact Jesus’ intention was to take ordinary staples of life and imbue them with the sacred memory of himself…not so we would have a monthly, or quarterly, or weekly ritual “in a church,” but so that as we break bread and drink wine together in loving fellowship, the memory of Christ is front-and-center. This is certainly consistent with the way God instituted the teaching of his law even from old: to talk of it “when you sit in your house, and when you walk by the way, and when you lie down, and when you rise” (Deut. 6:4-8). God’s intention was that there be no boundary between the sacred and the profane, but that every activity in which his people engage, be an opportunity to learn and remember his way. It’s also consistent with the character of Jesus. Though as I mentioned above, he was no stranger to ritual, Jesus was also the one who got in trouble–along with his disciples–for not keeping the Sabbath in the rigidly-prescribed manner of the Pharisees (Mark 2:23-27 and parallels). More importantly, though, we learn in Luke 24:35 (the two disciples who met Jesus on the road to Emmaus) that Jesus was “known to them in the breaking of the bread” (Luke 24:35). Might we, by sacramentalizing the “breaking of the bread,” have robbed ourselves of the opportunity to know Jesus each time we sit at the table? C.S. Lewis said something similar about wine in his essay “Miracles,” which is part of a collection entitled “God in the Dock.” Lewis was talking about the miracle in which Jesus turned water into wine at Cana, and suggested we only really recognize the miracle when “if whenever we see a vineyard or drink a glass of wine we remember that here works He who sat at the wedding party in Cana.” I find this strangely compelling, particularly if taken together with Jesus’ own words in Mark 14:25 and parallels: “Truly, I say to you, I will not drink again of the fruit of the vine until that day when I drink it new in the kingdom of God.” Jesus, it seems to me, was inviting us to remember him, not only in a formalized ritual, but every time we lift a glass of wine. So what does this mean and why do I care? I believe that by ritualizing the Lord’s Supper, we may be missing the presence of Jesus in the everyday. Our ceremony has created–or at least heightened–a false dichotomy between the “sacred” and the “profane.” Jesus, in contrast, calls us (as God has since the Old Testament) to see the sacred in all of life…in particular the life of followers of Jesus in community–communion–with each other. I do not (necessarily) advocate the abandonment of the sacramental ritual, for it has brought blessing and comfort to many for many years. But however necessary–or at least appropriate–our ritual is, it is not enough. Buddhists have a concept they call “mindfulness.” I’m no expert, but the best I understand, it involves disciplining oneself to be conscious of the present moment and all that it contains. I suggest we consider a different, perhaps more timeless form of mindfulness, in which we recognize Jesus every time we break bread and look to his coming every time we share wine. In remembrance … till he comes! Good morning Dan. Its been a while since I visited. I like your new site. Whether you know it or not you seem to be fully immersed in Quaker theology (but they don’t necessarily call it that) in that they don’t practice the Lord’s supper as a church event but instead every time they take nourishment. I am tending to believe as you seem to also that they have it right. Although it is nice top do it with your fellow congregants it should be done at every meal. In my post at http://redletterliving.net/2010/06/10/parallel-gospel-verses-%E2%80%A6-part-3-the-last-supper/ I mention that I am somewhat troubled that each of the four gospel accounts has a different manner of implementing this treasured event in Christiandom. In that post I use these differences to show dispute the “literal and inerrant” folks but it also confuses me that if the last supper is so foundational to most Christian denominations then why is it spell out the same by the gospel writers? Thanks, RJ, it’s good to see you again! I always appreciate your visits. I appreciate the Quaker perspective (is there such a thing in the singular) very much. Where I would depart is that Quakers seem, at times at least, to have rejected even the symbolic practice out of hand in rejecting the sacramentalism of it. I tend to go for somewhat of a “both/and” perspective where I believe there could still be teaching value in the collective practice, just that it ought to be de-mystified and certainly removed from the purview of clergy-only. As to your observation about the different accounts in the four gospels, this is only troubling if, in fact, Jesus’ intent was to inaugurate a formal ritual. If, as I rather suspect, he conducted a symbol-rich teaching moment with the Apostles, which they later chose to memorialize “in remembrance,” the fact that they remembered different details bothers me a whole lot less. What’s more troubling to me is that the church seems so quickly to have slipped into the mold of creating religious ceremonies out of something that was both more beautiful and more (dare I say) earthy before they ritualized it. Good post, and a good point. Remembering the sacred in the middle of the mundane is a great thing to do in theory, a bit more difficult in practice… but still worth striving for. I grew up Catholic but have been involved with various other denominations in the 25+ years since coming back to faith during college. 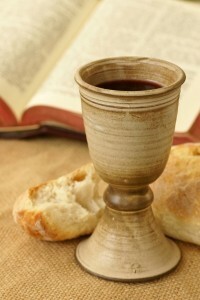 Although I don’t think I buy the complete “transubstantiation” claim of the Catholic communion of my youth, in some ways I prefer it to the “remembrance” style “Lord’s supper” where I’ve been going to church for years. That is, I miss the sense that there is something truly sacred happening when we take communion while we believe that the Lord is present (either in actual body or just in Spirit). When we take communion and just “do this in remembrance of me” (believing that the cracker and juice are just a cracker and juice), it just doesn’t seem as alive to me. Just another area where the church is missing out on the sacred? Your post touches, loudly, on one of the very subjects I have been asking God to give me a deeper revelation of for many years now. Slowly it has been coming to me. I have long recognized “Communion” as “just another ritual” and I seriously do not believe we are expected to keep rituals now that the Dispensation of Grace has been given via the New Testament. All of that being said, recently God has given me what I believe is the deeper meaning of “Communion”, a meaning in which I will be writing about on my blog later down the road. But knowing that Jesus is more concerned with our relationship with our neighbors, our total community, even more so than he is concerned only about himself, your post speaks volumes to me and confirms what God has spoken to my own heart. Thank you. I just happened upon your site today via Facebook and I love this post. The more I reflect and study Yeshua outside of contemporary, evangelical Christian thought, the more I see of this kind of thinking.